In the welcome section, I was asked if I can offer some info I what I was doing with my new Pedersoli percussion .54 cal Tryon. 55grns over a .012" lined patch. On Thurdsay last we made our regular visit to the range to practice. Not unusually for this time of year it was blowing a gale. So much so that the can of percussion caps was blown of the table. 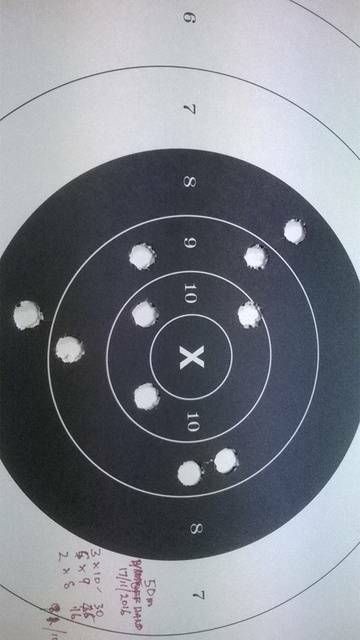 Consequently shooting was a tad difficult so the scores could have been better. Just in case the eagle eyed among spot more than 10 holes in the target let me explain. Our course of fire is 13 shots over 31 minutes.We drop the lowest ( 3) as sighters and count the rest. 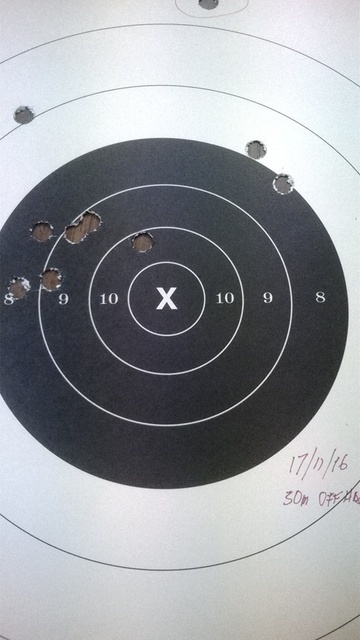 Both the practice targets shown were shot at 50 meters. Good shooting! Next time take some pictures of the shooters on the range if that's allowed! I can do that, but even my friends who shoot practice sessions along side of me shoot Quigley's which is what I call their Pedersoli 45/70 Sharps suppository guns. Actually they are not too bad,shooting wise.It is when some b******d rocks up with with say a 7mm magnum and sets up camp on the bench beside you. Crikey! even with earplugs and such ,the discharge noise of the bloody things, loosens the fillings in my teeth, aaaagggh! That's the price you pay when when you share a multi discipline range. So pics will have to wait a fortnight. What I will do is save the photo taking for ML comp day when all the shooters, shoot reasonable guns, not hand held artillery pieces. "suppository guns" .............been wondering what to call my Business Rifle since '85!